It's Taco Tuesday don't you know and I was craving an old comfort food - taco pie. My sister used to make a recipe that involved refrigerated crescent rolls as the crust, ground beef, cheese, sour cream, etc. I don't have her recipe but came up with a vegan version that we all really enjoyed (when I say "we all" in reference to Mexican food I am automatically excluding H as she doesn't like Mexican food. I've said it before but if we didn't look so much alike I would demand a DNA test because I think she was switched at birth ;-) I love Mexican food). Pat the tart dough into a pie dish - spreading it out evenly. 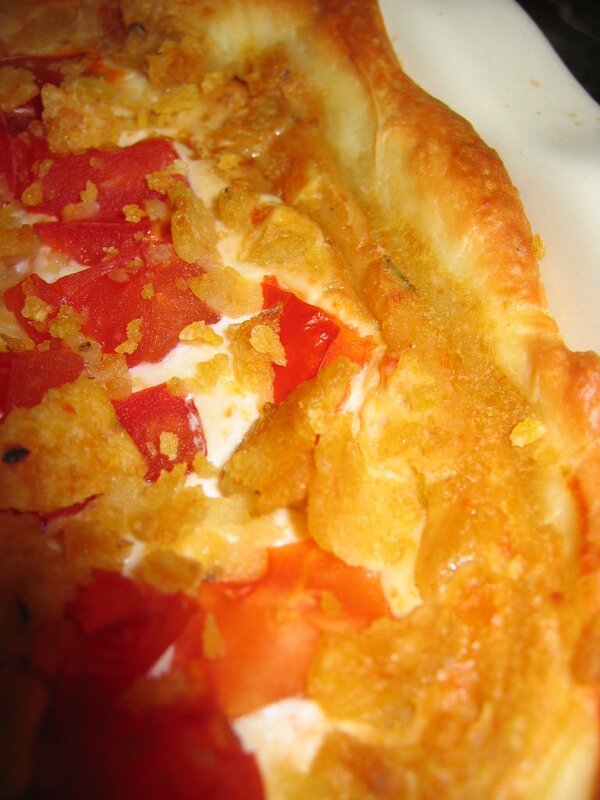 Sprinkle 2/3 of the crushed corn chips over the dough. Mix the TVP with the taco seasoning and add just under 1 cup of boiling water - blend thoroughly and let sit until reconstituted. Whenever I used TVP for tacos or in this kind of recipe I like to cook it in a frying pan for a few minutes to dry it out a little and keep it from being one big lump o' TVP. While it's in the frying pan add 1/2 cup of olives and blend. Put this on top of the crushed chips, spreading out evenly. Take one cup of the cheese sauce and mix it with ~ 2 Tbs. salsa (I used a fairly spicy one). Spread this over the TVP. Next take the sour cream and spread it on top of the cheese sauce. Top with the chopped tomato and the remaining corn chips. I ended up taking it straight from the fridge and putting it in the oven cold. I started the oven at 350 and eventually turned it up to 375 or so and it took an hour. 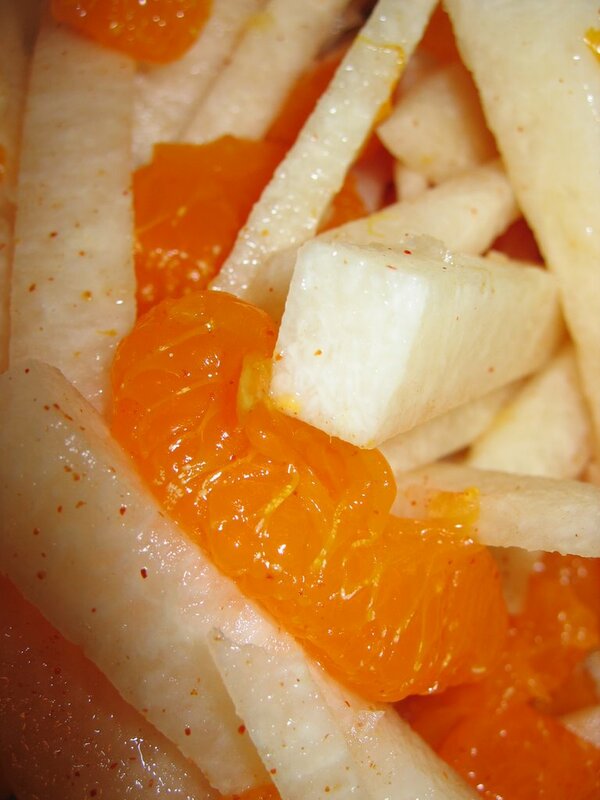 For a side dish I cut up a jicama and tossed it with bit of salt and cayenne pepper and mandarin oranges. I loved the heat of the cayenne with the sweetness of the oranges. We also had a fresh pineapple that was PERFECT and a cantaloupe that was surprisingly pretty close to perfect. I looooove Punkmommy's Cheez recipe! What do you use in place of the egg in the dough recipe? Looks like another winner! My boyfrined will be loving this! Oh dear - no Minnesota slight intended! Although I do have a cousin in Duluth and I could just listen to he and his wife talk all day. Thanks for coming by Crystal! Wow, jicama with mandarin oranges. That sounds like a great combo, and of course i am going to try that as well as the taco pie above. YUM!